Boylan Bottling Company has been making delicious sodas in small batches since 1891. Since then, Boylan has remained true to its roots and committed to producing only authentic handcrafted soda. Boylan hand-crafted sodas stand on their own and they speak for themselves – no hype, no marketing gimmicks. While Boylan sodas may cost more per ounce than the big soda pop brands, all of that cost is in the product. With their unique, bold flavors, Boylan sodas are meant to be savored. The are delicious and much better tasting than leading carbonated soft drinks. Boylan uses only the best flavors available and only pure cane sugar (instead of high fructose corn syrup) to enhance those flavors. They package their sodas up in thick glass bottles with just enough carbonation to enhance the flavor rather than cover it up. The end result is a soda whose flavor surpasses that of any leading soft drink you will ever try! 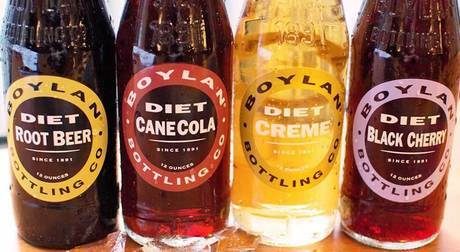 Boylan's cane-sugar-sweetened sodas come in a wide variety of vintage flavors. I received samples of Boylan's Diet Sodas in Diet Black Cherry, Diet Root Beer, Diet Cane Cola and Diet Creme Soda. Not usually a fan of diet soda, I was skeptical. I began with the Diet Creme Soda, fully expecting it to have that terrible diet taste that I despise. From the first sip, I was very pleasantly surprised! I looked again at the bottle to double check that I was indeed drinking a diet soda. I just could not believe how delicious my Boylan Diet Creme Soda tasted. It was definitely the best creme soda I had ever tasted, and without a doubt the most heavenly diet beverage that had ever encountered my taste buds. I could not even tell that it was a diet drink. Is this what I have been missing all these years? I would give up sugared sodas forever for this! My son grabbed the Diet Root Beer, My husband enjoyed the Diet Cane Cola and my daughter snagged the Diet Black Cherry and we all agreed that Boylan Diet Soda is hands-down the BEST diet soda any of us have ever tasted. It is THAT GOOD! Disclaimer: I received samples of Boylan Soda to review and to keep. The opinions are my own.